Morningstar have coined the witty term flowmageddon, in this article, for the on-going outflows that many in the active asset management sector are experiencing. 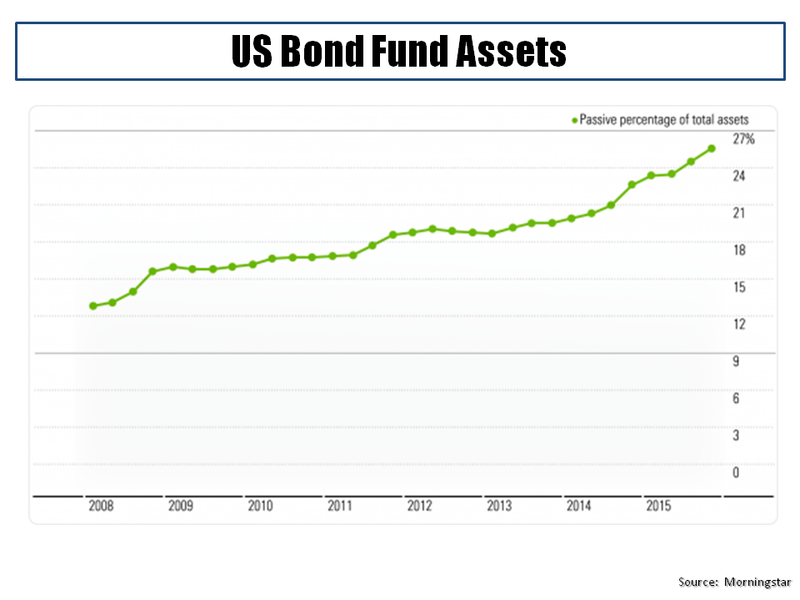 In the US, passive equity funds have doubled their market share over the past decade and now make up over 40% of invested assets whilst bond fund assets have grown to over a quarter of the market, as the graph below shows. The competition from passive investments such as ETFs has forced fees down for active managers. As per this FT article, Tim Guinness, chief investment officer of Guinness Global Money Managers Fund commented that “the days of great prosperity for active fund management may be behind us”. In other words, flowmageddon is leading to paymageddon! According to this recent Economist article, the future for many active asset managers does not look too bright given the costs of increased regulation, such as the new fiduciary rules from the Department of Labour in the US, and the increased ability of technology to replicate complex investment strategies without the need for a load of vastly overpaid investment managers . Given that the majority of active managers consistently fail to beat their benchmarks after fees, the on-going shakeup is no bad thing. This entry was posted in Equity Market and tagged active asset management, active managers, advances in technology, benchmarks, digital technologies, ETF, exchange traded funds, fintech, Flowmageddon, increased regulation, institutional investors, investing ideas, investment ideas, investment risks, investment strategy, market share, Morningstar, passive asset management, passive funds, passive managers, paymageddon, technology, Tim Guinness. Bookmark the permalink.